is it really needed to have the ball-spring bearing retainers on the ends of the cores? I have an option to get some rollers that don’t have these. I think I misunderstood your question, you can not use a Kluge truck with a different design roller. if you launch a roller wile in operation it would most likely be your last job. I mean the little spring loaded balls in the ends of the cores, they seem to be mostly there so the bearings (not trucks) don’t fall off when you have the rollers off the press. Some sellers show cores without these—-? 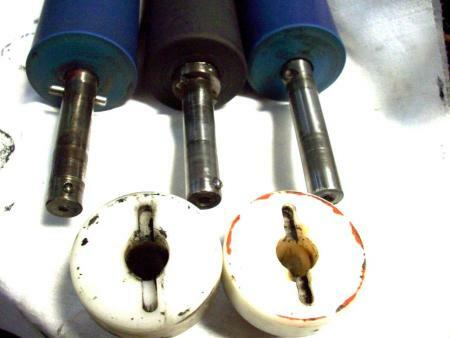 We have three basic types of kluge roller cores. The one on the left has the spring ball and I like the cotter pins, they match the recess in the trucks. The middle core has the spring ball and a very sturdy cotter pin device with a square shaped pin but the pin itself isn’t big enough to fill the recess in the truck. This may have been designed for metal trucks. The core on the right has no spring ball and we’ve been using it for years, so yeah the spring ball is unnecessary. The thing I don’t like as much is the shape of the cotter pin because it is rounded and smallish compared to the truck recess. If you look closely at the truck on the right you can see how a small cotter pin has worn away the plastic so that this truck will just spin on the core in one direction which might be problematic for proper inking. I forgot to mention above that the measure of the length of the rubber on the roller without the spring ball is actually too short at 19.5” and the measure between the cotter pins at 20-1/4” is too short but I was able to make some spacers to keep the unit in the saddle properly. Without the spacers it kinda looks like the bearing is not kept pushed in to the saddle like it should be. The measure of the rubber on the other two rollers with the spring ball feature is 20” and 20-3/8” and the measure of the space between the cotter pins is 21”. These two fit snugly with the bearing having no room to back out of the saddle. Also the space between the inside edges of the rails is 21” so that matches the space between the cotter pins. Also, in regards to the spring ball feature, it only works, to keep the bearing from falling off the core when it is off the press, with the old style sealed bearings that no one seems to be making anymore. The bearings that seem to be the only ones available now that are not sealed must be slightly too large in their inside diameter because they slide right over the spring ball and fall off the core without catching on the ball. So when ordering new rollers, I myself would be more concerned with the actual dimensions of the unit and not that spring ball feature. TY- Very interesting info. I have 4 cores with the press, 2 with the roll pin, and 2 with the collar-with-integrated-key. Those have part of the key part worn off on both cores, so I set those aside for now. Sent the other 2 cotter-roll pin type out to be recovered, so will see what I get. I have the micarta type trucks for those. For further new rollers I see offered some with delrin trucks, and some with aluminum, neither with the spring ball. I have a container of what I guess are the original ball bearings. I’ll take your info seriously about adding spacers if needed to keep the bearings in the saddles! You are correct my point would be, you can not switch designs. pinned rollers need pinned design trucks. my rollers are pinched core design and need my trucks that have slots for them. The fit is important about 1/16” of play no outwards pressure on hooks and not to much play or you risk falling out of hook. there have been many roller makers over the years. you do not want to mix there parts, washers could help out. it has got to the point it is cheaper to make a new core over taking rubber off the old one, including trucks on all my Kluge rollers has made it simpler and safer for me to sell. I’m sure that when the rollers that I was refering to were purchased that they were bought as “Kluge” rollers even though they were short. There may have been an error in the order or whatever, and someone accepted them here and started using them and now that I work here I’ve found a way to get them to ride properly. What I was trying to say, I guess I wasn’t clear, was that If I bought new rollers and cores now I would make sure of the specs I needed and what was being offered. No one should have to add spacers to use rollers. They should come properly sized and ready to use, right? That’s all. Every machine tool I have ever seen utilized some kind of methodology for keeping rollers, gears, bearings and wheels from coming off the shaft they are on… except for printing presses. Now, given that all of the presses I have dealt with in recent years have been older than I am (62), I’ll cut the designers some slack. Probably they worked better when new than they do now. After a few decades of hard use with professional maintenance and then several more without much maintenance and spare parts made of unobtainium, I’d say that their working at all is somewhat of a miracle. Twenty-five years ago or so when I worked on a farm I was often asked to keep hundred-year-old farm implements working. Try ordering parts for a McCormick side rake some day. Had it not been for the farmer’s Grampa’s forge, we’d have been SOL. As it was, we forged more than a few parts from bars of iron. I know I’m long-winded, but in a nutshell; you use what you got, not what you wish you had. I wish that I had longer shafts on my rollers so I could put washers and cotter pins on the outside of the saddles. As it is, I used washers, epoxy and Shoe-Goo to achieve the same ends. I appreciate your comments about the experience of maintaining old equipment and making something work even if it’s not quite right. I place a very high value on those qualities. But if I can help someone else look for a part that fits instead of one that almost fits, and they found it, then I’d be as happy as Na’vi in Hometree about that.